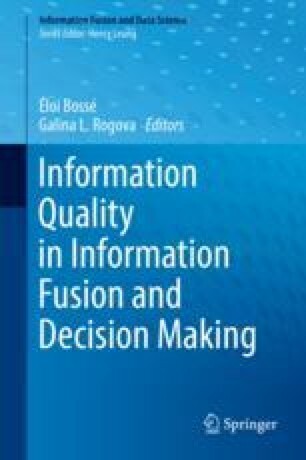 Our objective here is to obtain quality-fused values from multiple sources of probabilistic distributions, where quality is related to the lack of uncertainty in the fused value and the use of credible sources. We first introduce a vector representation for a probability distribution. With the aid of the Gini formulation of entropy, we show how the norm of the vector provides a measure of the certainty, i.e., information, associated with a probability distribution. We look at two special cases of fusion for source inputs, those that are maximally uncertain and certain. We provide a measure of credibility associated with subsets of sources. We look at the issue of finding the highest-quality fused value from the weighted aggregation of source-provided probability distributions. Ronald Yager was supported in part by an ONR grant award. Fred Petry would like to thank the Naval Research Laboratory’s Base Program, Program Element No. 0602435N for their sponsorship.